Researcher Spotlight: Benjamin Lawler, Ph. D.
Faculty researcher, Professor Benjamin Lawler, Ph.D., joined the Department of Mechanical Engineering at Stony Brook University in 2015. 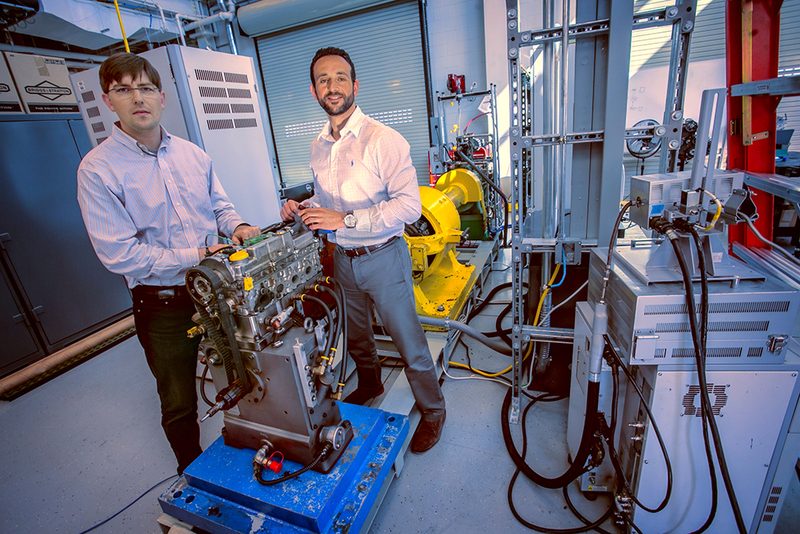 Prof. Lawler’s research is focused on efficiency and emissions of internal combustion engines. He is a two-time recipient of the Mechanical Engineering’s “Students’ Choice Award for Excellence in Teaching”. One student’s nomination stated that Prof. Lawler, “demonstrates unparalleled dedication and respect toward his students, treating them as equals in his pursuit to both educate and inspire.” In celebration of this award, he has been selected for the Researcher Spotlight of Summer 2018. What interested you in joining the Department of Mechanical Engineering at Stony Brook University? In high school, I was a math and science tutor. In college, I was a supplemental instructor, undergraduate teaching assistant, general tutor, and academic program mentor. Through these experiences, I knew that I loved teaching and helping others better understand complicated math, physics, and engineering concepts. This is what motivated me to go to graduate school, get my PhD, and to seek academic positions. I made that decision 11 years ago when I was a rising Senior. I've been working toward that goal ever since. I was interested in joining Stony Brook to fulfill my dream of working with students and to start my own research program. What do you like most about working at Stony Brook? The thing that I like the most is working with the students at Stony Brook. I appreciate teaching the students a topic that they would not otherwise know, which develop into skills that they can carry into their future endeavors. In what area is your research focused? I do research on internal combustion engines. I try to find ways to better understand the physical and chemical processes that happen inside the cylinder so that we can improve the efficiency and emissions characteristics of combustion engines. What interested you in internal combustion? I was interested in all aspects of mechanical engineering, including thermodynamics, heat transfer, fluid dynamics, mechanics, and dynamics. For me, the internal combustion engine is a device where all of these areas play an important role in the performance. Additionally, internal combustion engines are vital to meet the transportation needs of our society. The transportation sector consumes approximately one third of the energy used by the U.S. and contributes a similar fraction of the U.S. CO2 emissions. Clearly, there is a great need for higher efficiency engines to meet our transportation needs and reduce energy consumption and CO2 emissions. What career advice would you give to students who are looking to work as a Mechanical Engineer? Two pieces of advice that I can offer are: 1) Take pride in the work that you do, but don't have pride in yourself. Instead, be your own harshest critic, because admitting our mistakes and accepting fault is how we improve ourselves and become better people. As soo n as you start thinking that you're the best at something, then you've stopped learning. And 2) Do the best job that you can at any given moment. Sometimes the cards are stacked against you and the best job you can do is get through a bad situation. Other times, things will work in your favor, the stars will align, and if you do the best job you can during those moments, you'll go far. Some things are beyond your control, but that's alright. The only thing that you can control is your response to the situations that you're in. So all we can do is the best job that we can in any given moment. Are there any "fun facts" about yourself that you'd like to share? I play piano and guitar. I used to have more hobbies, like playing sports (mostly soccer, basketball, hockey, and frisbee), when I had free time. I met my wife in high school. Instead of coffee, I drink one can of coke per day, and if I don't get my can of coke, my wife will tell you that I get cranky.